Standardized tests are those tests that are often used in the educational scenario. These assessments are performed by educational experts and are utilized by many of the schools and colleges across the world for a plethora of reasons for various purposes. The standardized tests were first introduced in the United States of America during the early parts of 20th century. Standardized tests are mainly used to reiterate the fact that all children should become literates irrespective of caste, creed and religion. Let us now look at the very definition of the standardized test. But, What Do We Mean By The Term ‘Standardized Tests’? These tests are a special type of tests that are widely practiced in the United States along with many countries in the world. It is a state mandated examination which all of the students must take on a global platform. They are mainly designed to assess the performance of the students in an assortment of subjects like English, Maths, and Biology and so on. The intensity of the questions and the pattern of the question paper will be uniform throughout the world and only the language in which the exam is conducted varies. Thus, the pressure of examination will be obviously higher amidst the parents, teachers and the students as the exam is answered on a global level. So, the efficiency of this type of program has become a highly controversial topic in today’s education field. 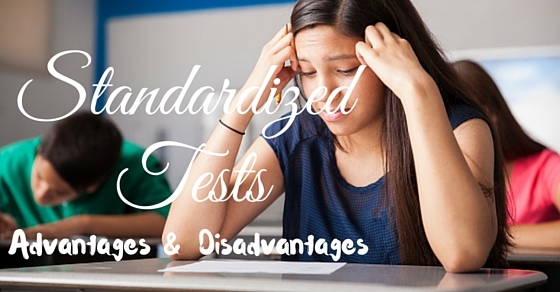 Let us now take a look at the demerits and benefits of standardized testing that are involved. Well…as the paper is a completely objective type of paper with only encompassing multiple choice questions, even a small child knows that he/she has to tick any one of the boxes provided there under a question. So, it is easy to think of a logical or a practically plausible solution out of the options given, if the question appears tougher, which saves a lot of time, instead of banging the head to decode the question and then find an answer. This also indirectly enhances the logical reasoning ability of the student. As the questions are fairly objective type of questions, by answering these kinds of questions, it can be ensured that everyone has a fair choice and these are unlike the normal subjective tests that are conducted in schools and based on the performance the students are graded. These normal tests have a fair share of bias, which arises due to a number of different reasons which by itself is a completely different topic. When competing on a global level, obviously the students start preparing themselves for an arduous journey. Naturally, a huge amount of studies and background research is done for each subject and thus a vast amount of knowledge coupled with a strong foundation is gained for each and every child with which strict standards of correction and evaluation arise. Also, every year owing to the last year’s stellar performance, the bar of competing is raised to the next level which squeezes the best out of the students. As the results are provided in terms of the number of right answers given along with the negative marks, as a whole, a tangible result arises. This in turn enables the teachers to see the proficiency level of each student and gauge the depth of the knowledge gained. Based on the consecutive performances and grades obtained, the deciding committee can either increase the distinction level percentages in a flexible manner. This point doesn’t need any introduction. With millions and millions of students appearing for a global level standardized tests, it becomes difficult to initiate manual correction and other related procedures. So, only computers can do this type of job without any glitches. Hence, both the conduction and the evaluation of examination are performed in the online mode only. As these kinds of tests provide some quantifiable information like scores (valid ones), the associated grades and proficiency levels, these can very well be utilized as a mandatory norm in order to gain an entry into another provision. For example, if there is a standardized school examination like the Matura school exam in Poland then that can very well be considered to secure admission in a Polish college. For example, those students who have a valid Matura score only will be taken for the admission process. Thus, as a whole to sum it up, the conduction of these assessment tests can very well be claimed advantageous for those reasons that are listed above. Apart from these, the standardized tests provide the strong spot and weak spot areas of a child. For example, if we consider mathematics, a child may perform well in Probability but may dwindle in Algebra. Also, it gives a student over a certain time period, an insight into how the same age children are performing in the same subjects. The results are authentically documented and can be verified at any time. Now, we have looked at a fair share of the advantages. Let us now look at the demerits also. How much ever these skills hone the various reasoning abilities of a student, it doesn’t come par with those personalized tests that are conducted by a teacher. A teacher only personally knows what is taught in the class and what isn’t. So, when it comes to the setting of a question paper, the teacher only should decide what type of questions should be asked and how much should the difficulty level be. More generalized questions that are dished out by considering the general students in mind and leaving out the other necessary parameters only is what these assessment tests do. Also, most of the questions asked in this manner only demand a huge range of general knowledge and reasoning, which is backed by many students unfortunately. As these exams have become a global mandate, most of the schools are focussing on the aspect of preparing and training their students adequately for these types of examinations. Thus, they put their teachers and working colleagues in a tight position to teach only what is specified in the exam curriculum and pressurizes them to finish a particular topic within the stipulated time, which curbs their ability and the freedom to teach how they want to and what they want to. Only a teacher will know what are the units that need to be completed first and what at last and an exam syllabi cannot do that precisely. Since most of the questions are considered as a hard nut to break, these students in order to surpass the huge insurmountable pressure of passing the exam in good grades, resort to cheaper methods of copying through various means. If got caught, there is no other alternative way. Apart from coining these type of terms as a ‘precise and to the point’ tests, there are also people who claim that these type of tests as inaccurate, as it doesn’t take into account the external factors that affect a child during an examination and only look at the voluminous preparation done by the child. Suppose, if there are any family based problems due to which a particular child is unable to perform well in the exam even though the preparation is adequate. What will happen in that situation? Will the colleges and the higher education authorities consider that factor as a valid one? Will an explanation offered by the child for the non-performance be accepted by the concerned authorities? These types of questions too linger, claiming the veracity of the validity of the examination itself. 1. 85% of the schools and elementary schools spend most of the year in rote teaching and prepare the students for these examinations. 2. All the educational assessment experts accept that this system has put the education in a perilous state. 3. No separate beforehand rating systems are given in this type, to gauge the students before they enter into exams. 4. These scores have become the ultimate fate of a child rather than considering its wholesome performance and assessing it completely before arriving at a decision. (4) the criterion of the managerial procedures often thwarts the examiner from getting hold of some useful information considering the conditions under which the student may able to improve his/her academic performance. Thus, we have looked at the merits and the demerits as well. Although standardized tests are valuable and also advantageous in some of the situations, its use in a rote manner without any changes getting implemented has also been criticized with the same degree, purposely because of the fact that such measures fail to inform the provided instructions adequately and are not followed by the same method that is destined to be followed and considered. Standardized administrations and the same type of admission procedures and other grants may not be possible for the students who are physically challenged and are also impossible for those students with mild disabilities. These disabled students can only take the tests in the standardized and formed way with some accommodations and other provisions like providing a scribe and a separate hall to do the exams and so on. Most of the adjustments, however, are the modifications to the norm or the concept which was being attempted to be measured.